Our unique space has tons of features such as exposed brick walls, arched ceiling, old car hood, sky lights, prep kitchen, and a yellow car lift from the 1930s. A unique yellow car lift (photo above) is from the 1930s and acts as the perfect table for your wedding, a dessert bar, gifts and cards, framed photos, or as a formal place card table. One of our favorite features is the old faded "CHEVROLET CO." sign painted on the side of our building and an old blue chevy truck hood on one of our interior walls. There are unique features everywhere you look at Studio 215. 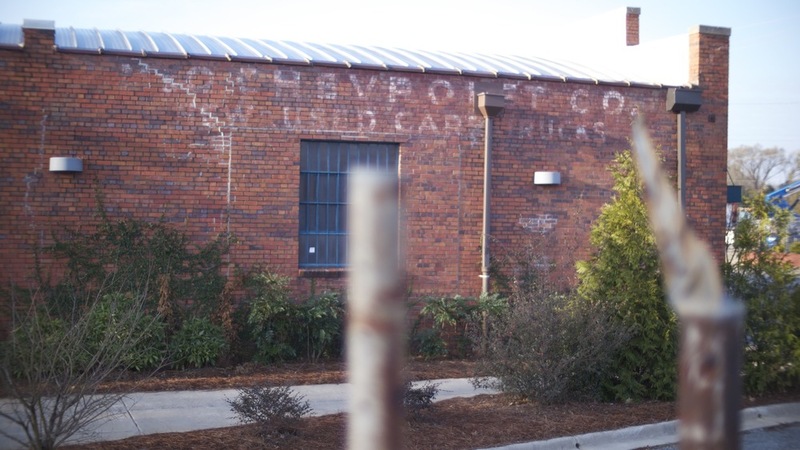 Our building was built in the 1930's and was the auto mechanic shop for the original Chevrolet dealership in downtown Fayetteville. It has been restored beautifully both inside and out. The exterior walls and landscaping are perfect for almost any photo shoot. One of the most photographed features is our spiral staircase. An old blue chevy truck hood adorns one wall and is one of the most eye catching features at Studio 215. Below is a photo of our bar on wheels made from recycled materials. We have two beautiful balconies in our big studio. The one in the picture below has an industrial spiral staircase. Our little studio has a single balcony/ mezzanine with a spiral staircase as well.